Every now and then you see a relatively cheap and simple idea and think “why has this not been done already”. That was the case on Friday when, in response to the release of designs for the America’s Cup bases, Hamish Kieth suggested we need to paint the rest of the tanks at Wynyard as a backdrop. I think this is a fantastic idea and should happen regardless of the America’s Cup. These won’t even be the first tanks at Wynyard that have been painted and Hamish was behind the painting of eight tanks so far by artist Askew One. There were plans at the time to paint the rest of the tanks but it was stopped by council officials who didn’t want the public to become too attached to them. Waterfront Auckland, the council-owned body in charge of developing Wynyard Quarter, is understood to be miffed at Mr Keith’s plans to place artworks on privately-leased sites through Wynyard Quarter for up to eight years. 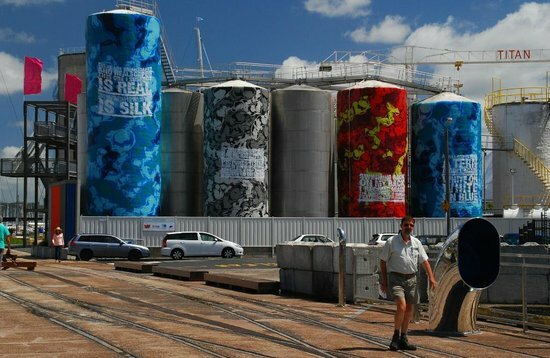 It is concerned about Aucklanders growing fond of the painted tanks and objecting to their removal for land development. Chief executive John Dalzell declined to answer questions, but in a statement the council body said it had been approached by Mr Keith with a proposal with funding and artists confirmed and an agreement from the owners of the tanks. “We looked at it and supported it on the proviso that the public nature of the waterfront was acknowledged and once the first phase had been done we’d look at the public response before supporting any further work,” the statement said. Not doing something like this now and keeping an area dull just because it might make things a little harder in the future is a really poor argument. I ope they don’t try that one again this time. Paint them so that they fade away over ten years? While we are at it, can we ban grey apartment buildings? The Orange is stunning. Why do we allow so many others of such a nullifying tedious hew to impose on our skyline? I see a grey tank and I want Askew One to paint it colorific! Why should try and make all buildings in Auckland as dull as possible to future proof them for future development. Why make life good now when there is the possibility of a better future. Be careful what you wish for. I doubt they are recladding in 80s bank HQ marble. And I wouldn’t mind knowing what the Aotea Centre is going to be reclad in, and what it will cost … concrete looks pretty low maintenance to me. I realise that was sarcastic, but that would be fantastic. Right, so the limitation decision about the “8 years” as a public work of art thing was 6 years ago, so officially there 2 years left on the existing ones before they to have to succumb to a bland paint job or just being removed? And meantime since that “edict” we’ve had to put up with all those crappy looking tanks when we could have something interesting and unusual to observe and enjoy – instead of raw-industrial mid 20th century grunge we’ve seen there for seemingly, forever? To be honest I think there’s more of a chance the [yet to be painted] tanks are still there, standing – whether painted in colours or not, than we will be still holding the cup, and/or are hosting America’s cup races from bases there. So any 8 year limit on their lifespan is wistful thinking by WA. Events they can’t control will force their hands for good or ill. 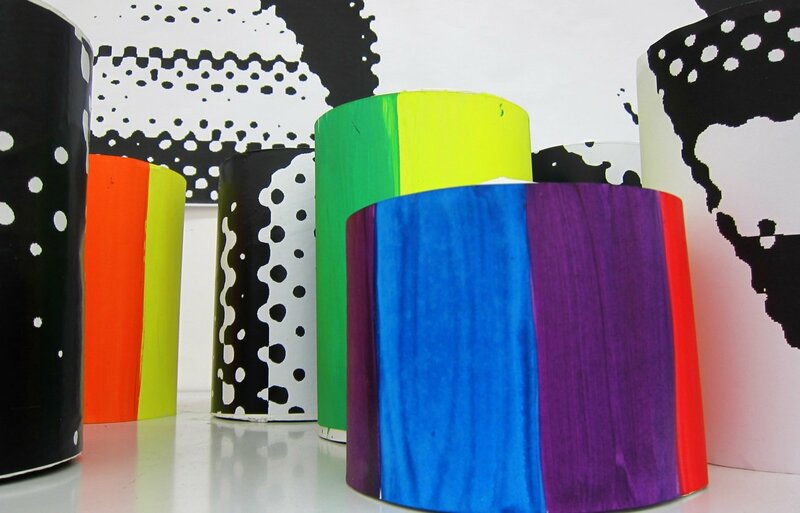 Paint the lot I say – regardless of where the cup bases are going to be located or what these bases look like. And while on that subject – seems to me these Amercas cup yachting folks and their hangers on, make it clear that they expect the red carpet rolled out for them and their mates, wherever they, and the cup go, whatever the cost – just as long as someone else is footing the bill for them. Well the America’s cup is nothing but a business, so time to face the reality, The days of us buying red socks to fund “our” cup campaign are over. It’s time that “Emirates Team NZ” should stop trying to pull the woollen [or otherwise] socks over our eyes on that one or that we let them. Auckland Council and Waterfront Auckland have got a lot bigger fish to fry in the next decade or two than planning on hosting a few boat races for 5 minutes. Even if ATEED is working itself into a wet lather over the possibilities of that opportunity. We need proper, solid, deliverable redevelopment plans for that area,. Plans for which the cup folks can fit in to and be part of, not apart from. So no plans that bend over backwards to make tonnes of room for them, while we collectively foot the bill for enabling them to do so. We we will suffer the rushed planning and lack of other development that goes along with this hoopla. Because we all know that they’ll be up and gone without any care – as soon as NZ lose the cup – while we will live on with the “legacy” from poorly thought out or executed short term decisions. Just like we did the last time we hosted these guys 20+ years ago. We don’t build rugby stadiums for the very odd occasion when we host a World Cup Rugby event once every 20 years or so. So why do we plan on doing it to our most valuable public real estate for some boat races? Erm yes we did, spent $390m on the stadium! +1, I think there is a great city building opportunity from the America’s Cup too. We could reclaim a whole lot more of the port to actually be part of the city just like we did at the Viaduct. On a sunny day the waterfront area looks beautiful with the sparkling water. Not so on a grey day. Few trees and lots of grey concrete and asphalt. The smell of fumes. I would like to see more colour. Yes. All that and more. Most of our native plants and animals are struggling. I would prefer the art to look like trees and plants that add harmony and ‘green’ the area. The proposed designs are too metallic, industrial, and underground feeling and may make the area feels uncomfortable. For some reason possibly related to the words ‘it was stopped by council officials who didn’t want the public to become too attached to them’, the image of Pink Floyd’s flying pig at Battersea sprung to mind. I’m fond of the painted tanks, but also damn keen for them to be removed and the area redeveloped. Did the council actually do any research before that snippet, or did somebody just vomit a stream of consciousness and everybody else was too bored to question it? This isn’t a binary situation and the reasoning was very lazy, at best. Whilst I’d love to see more tanks painted, the obvious question is cost. Considering that the council is lacking funds, and that the tanks may well have to be removed in the near term, is this the best use of rate-payers funds? As for planting the tanks, I’d be concerned about the loading on the structure and potential damage to the substrate (be it insulating foam or an additional coating). That’s assuming that a substrate is required – Stainless steel isn’t very easy for plants to grow on. Paint one as R2-D2, one as a Dalek, one as Spongebob Squarepants, One with Oscar the Grouch, etc. etc. Can you clean these things up for a different use? or would contamination mean they need to eventually go? I agree that it would be good to keep a few as a historical nod to previous use, among the eventual grass and modern structures. Like Silo Park.